Years ago, right after I moved out on my own for the first time, I remember watching a fairly forgettable sitcom, The Torkelsons. The show was about a single mom raising a family of five kids on her own. In one episode, her aunt comes to visit and asks her. "What is the wrong way to eat spaghetti." I don't remember much about the rest of the story, but I think the mom in the show was jealous of the carefree life her aunt had lived. However, at the end of the episode, the aunt answers her own question. 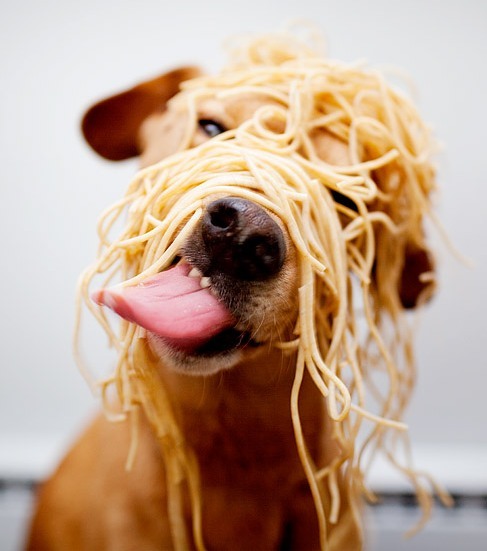 The wrong way to eat spaghetti is alone. This resonated with me at the time, trying to get used to living all by myself, with no family to fight with, play with, or just hang out with. I finally adjusted and even grew to appreciate living on my own. After more than a decade, my brother lived with me for about a year before his marriage and it was hard to let him go. A couple of years later, Maria moved in and within a year, we moved here to Maryland and we lived with my parents. Now I'm on my own again, and there are things about it that I love. I enjoy my privacy and freedom to choose how to spend my leisure time. I really love having the space for all of my stuff and the time to play with it. I couldn't have Pixie if I weren't in my own home, and crazy as she is, she's still charming and loveable. I'm happy to be on my own again in so many ways. But then again, long Sunday afternoons can get so lonely. Fostering or adopting would fix that, but is that reason enough to make such a huge change in my life and risk letting the child or children down? I'm not sure. I just keep thinking, do I want to eat spaghetti alone for the rest of my life? I love spaghetti but the gluten free stuff isn't that good. I wish I was around Sunday to hang out with you but I had to go to work. We are always letting people down and they often return the favour. That's what relationships are all about. That's the way we learn to deal with disappointments both large and small in, hopefully, a healthy way. I think that's why God created us to live in families. On the other hand, my mother-in-law lived on her own for 40 plus years but she was the most socially active person I ever knew.